AUGUSTA, Ga. – It is the most exclusive and coveted patch of land at this most exclusive and coveted patch of land – a small holding area behind the 18th green of Augusta National on Sunday afternoon at the Masters. This is where they bring the family of the presumptive winner, a bit of geographical calm amidst the crush and chaos of the crowd. In 1997, it’s where Earl Woods stood. He wasn’t supposed to be anywhere near here; doctors had ordered he avoid flying due to heart concerns. The old Green Beret wouldn’t listen and when his son Tiger won the tournament at 21 years old, changing not merely their lives, but golf and society as a whole, they shared a bear hug full of appreciation and admiration and love, most of all. On Sunday, that same spot is where Charlie Woods stood, this familiar ground for his family, whether or not the 10-year-old knew it. His grandfather had passed away before he was born, but he’d been brought to Augusta National by his grandmother, who’d been here before, and along with his older sister, Sam, who hadn’t. He was brought there because his father, now 43 years old, was about to do something that once felt so easy yet now felt so remarkable that all around Augusta cheers were cascading into the sky and tears were running down cheeks. As Tiger walked off the green a champion again, he saw his son in the same place he once saw his father, and all these years later, through recurring pain both personal and physical, it was like nothing had changed. It was son and father. And now father and son. Golf is a game handed down through the generations, capable of inspiring as well as uniting, and there haven’t been too many figures who have meant more to this place and this tournament than Tiger Woods. It wasn’t just fathers and sons here sharing in the moment. There were mothers and daughters and cousins and so many more. The crowd surrounding the 18th green might have numbered 10,000, the majority unable to even see Tiger Woods. The storms were coming but so too was Tiger, so too was history, so none of it mattered. Celebrities craned their necks next to volunteers. Cops shouted while guarding the ropes. Three members of the Augusta National clubhouse kitchen crew came out to witness it, eventually all hugging at the moment. So too did some college students who had worked in the gift shop. The green jackets cheered from the veranda. The manual scoreboard operator on 18 clapped his hands in delight. Other PGA pros, defeated and dejected and usually looking to skip town as fast as possible, instead stuck around to cheerily congratulate the guy who just beat them. “The atmosphere," runner-up Brooks Koepka marveled. "Incredible." It meant something to everyone. 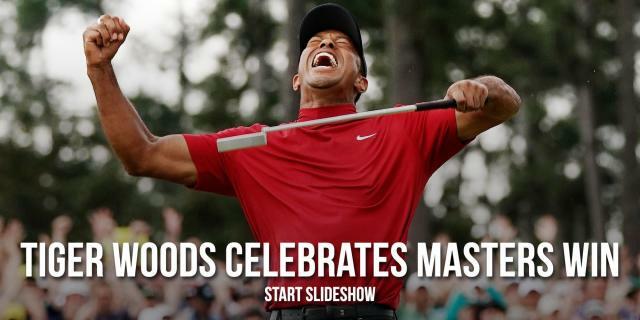 Tiger Woods had won the Masters, coming in at 13-under to beat the field by one, coming from behind to win a major for the first time in his career, coming back to the brink of history to inspire and uplift and excite once again. From the madhouse around the 18th of Augusta, to television rooms around the globe, where an older generation tried to explain to a younger one just how magical this was, just the way it was back in 1986 when their parents and grandparents explained to them what it meant for Jack Nicklaus to win this tournament at 46. For Woods, having his children here was everything. They’d never been to Augusta before. For years they rarely came to any tournaments. They certainly knew that their father was a legend in the sport, but they saw the despair that it brought to him, not the glory. Injuries had hobbled him, left him spending too many days prone on a couch unable to play with them, cook for them, hang out with them. Attempts at swinging a club could leave Tiger doubled over or even terrifyingly collapsed on the ground. There were surgeries and rehabs and inevitable depression when the latest plan went bust. It cost him in other ways, too. His golfing fame helped fuel personal failures that doomed his marriage and turned him into tabloid fodder that could rock anyone’s self-worth. It led to pain medication and legal troubles. It pushed Tiger Woods from that beaming kid of promise back in 1997 to that infamous mugshot and unflattering magazine covers. Golf had brought Tiger everything. And at times it felt like it had taken everything away. Against long odds and lots of doubt, Tiger did that. He went 14 years without winning here and 11 years without winning a major at all. In three of the past five Masters, he wasn’t even healthy enough to enter. Yet he kept grinding and kept trying and by last summer he was back in contention at majors and winning on the PGA Tour. By the time the Masters rolled around this year, he knew. “I had a pretty good feeling I was going to be able to contend,” Tiger said. So he wanted his kids here. He wanted Sam and Charlie, just in case. He long ago admitted he’d been a poor husband. He has never wavered in his desire, though, to be a good father. Through his darkest days of hopelessness, of the kind of infuriating physical pain that back injuries create, the unqualified love and support of his family had driven him to keep pushing. When Tiger hugged Earl it was about what they had done together, the lessons Earl taught Tiger about how to golf and how to compete and how to believe. 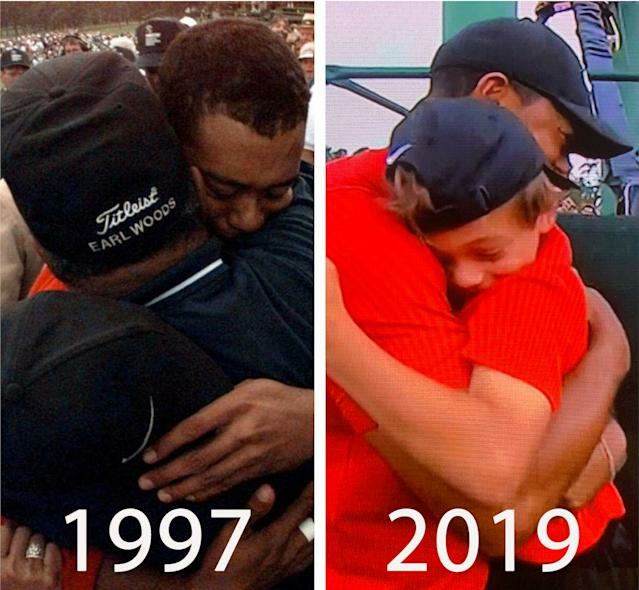 When Tiger hugged Charlie it was different … yet the same. They too, along with Sam, had done this together, not in developing a swing or a putting strategy but in the everyday reminder that even for the greatest golfer in the world, golf just doesn’t really matter. Family does. Bear hugs do. Love, most of all.